To check if the first stage loader from CPU ROM starts, connect pico-SAM9G45 board to your computer through the microUSB OTG port and run SAM-BA. In this case the board should not have a bootable microSD card inserted into the microSD slot. 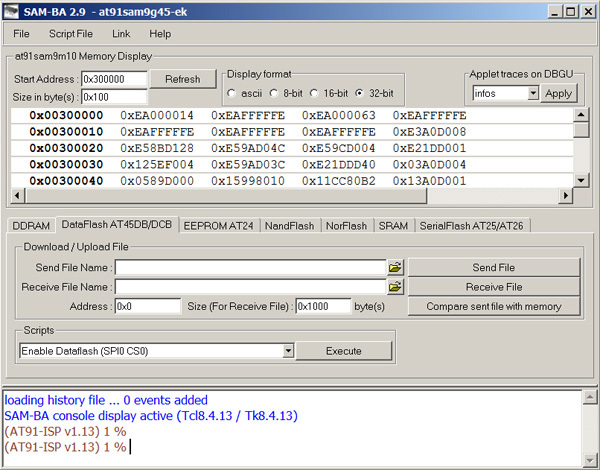 If everything is ok, SAM-BA should be able to connect and display DDRAM memory contents if you are using the SAM-BA GUI interface. Download a suitable version of Sam-BA from here and install it. Plug in the pico-SAM9G45 board and it should appear as "atm6124.Sys AMTEL AT91xxxxx Test Board"
Choose the USB Connection /usb/ARM0. Select the the at91sam9g45-ek board in the drop-down menu and press connect. sam-ba will then work correctly. Remember to remove the symbolic link when you are finished using the the utility, so that the system can create a real /dev/ttyUSB0 if needed.